Death Talk Is Cool At This Festival : Shots - Health News How to make thinking about death less somber? Hold a festival! Indianapolis did. Through art, film and book talks, residents explored everything from bucket lists to advance directives and cremation. 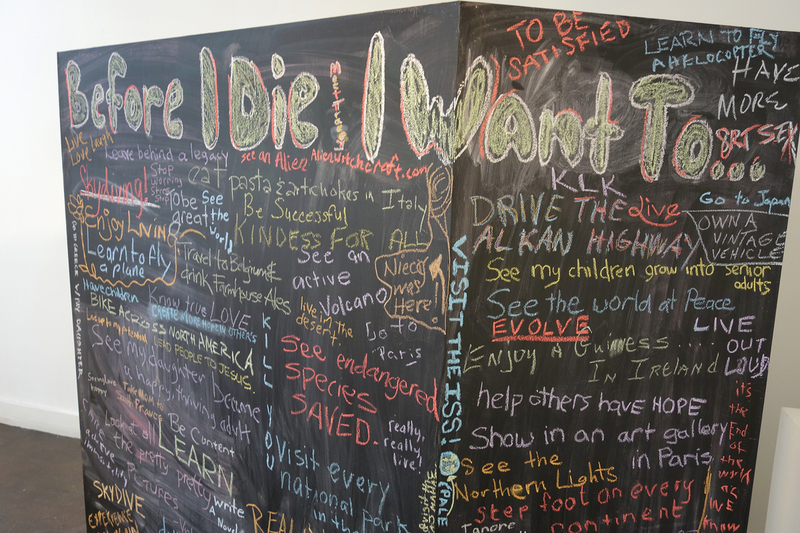 A chalkboard "bucket list" stirred imaginations and got people talking at an Indianapolis festival designed to help make conversations about death easier. Davis said he originally planned to jot, "I want to believe people care about me." But after his heart attack, he found he had something new to write: "I want to see my grandkids grow up." Others at the event grabbed a piece of chalk to write down their dreams, too, including some whimsical ones: Hold a sloth. Visit an active volcano. Finally see Star Wars. The cemetery tour was part of the city's Before I Die Festival, a weekend-long event with 22 activities held around the city in mid-April — the first festival of its kind in the U.S. The original one was held in Cardiff, Wales, in 2013, and the idea has since spread to the U.K., and now to Indianapolis. The purpose of each gathering is to get people thinking ahead — about topics like what they want to accomplish in their remaining days, end-of-life care, funeral arrangements, wills, organ donation, good deaths and bad — and to spark conversations. "This is an opportunity to begin to change the culture, to make it possible for people to think about and talk about death so it's not a mystery," said the festival's organizer Lucia Wocial, a nurse ethicist at the Fairbanks Center for Medical Ethics in Indianapolis. The festival included films, book discussions and death-related art. One exhibit at the Kurt Vonnegut Memorial Library had on display 61 pairs of boots, representing the fallen soldiers from Indiana who died at age 21 or younger. These festivals grew out of a larger movement that includes Death Cafes, salon-like discussions of death that are held in dozens of cities around the country, and Before I Die walls — chalked lists of aspirational reflections that have now gone up in more than 1,000 neighborhoods around the world. "Death has changed," Wocial said. "Years ago people just died. Now death, in many cases, is an orchestrated event." Medicine has brought new ways to extend life, she says, forcing patients and families to make a lot of end-of-life decisions about things people may not have thought of in advance. "You're probably not just going to drop dead one day," she said. "You or a family member will be faced with a decision: 'I could have that surgery or this treatment.' Who knew dying was so complicated?" With that in mind, the festival organizers held a workshop on advance care planning, including how to write an advance directive, the document that tells physicians and hospitals what interventions, if any, you want them to make on your behalf if you're terminally ill and can't communicate your wishes. The document might also list a family member or friend you've designated to make decisions for you if you become incapacitated. "If you have thought about it when you're not in the midst of a crisis, the crisis will be better," Wocial said. "Guaranteed." About a quarter of Medicare spending in the U.S. goes to end-of-life care. Bills that insurance doesn't cover are usually left to the patients and their families to pay. Jason Eberl, a medical ethicist from Marian University who spoke at the festival, said advance directives can address these financial issues, too. "People themselves, in their advance directive will say, 'Look, I don't want to drain my kids college savings or my wife's retirement account, to go through one round of chemo when there's only a 15 percent chance of remission. I'm not going to do that to them.' "
The festival also included tour of a cremation facility in downtown Indianapolis. There are a lot of options for disposing of human ashes, it turns out. You can place them in a biodegradable urn, for example, have them blown into glass — even, for a price, turn them into a diamond. "It's not inexpensive," Eddie Beagles, vice president of Flanner and Buchanan, a chain of funeral homes in the Indianapolis area, told our tour group. "The last time I looked into it for a family, "it was about $10,000." "Really, when it comes to cremation, there's always somebody coming up with a million dollar idea," Beagles added. "If you can think of it, they can do it." Beagles showed us a pile of detritus from cremated human remains. 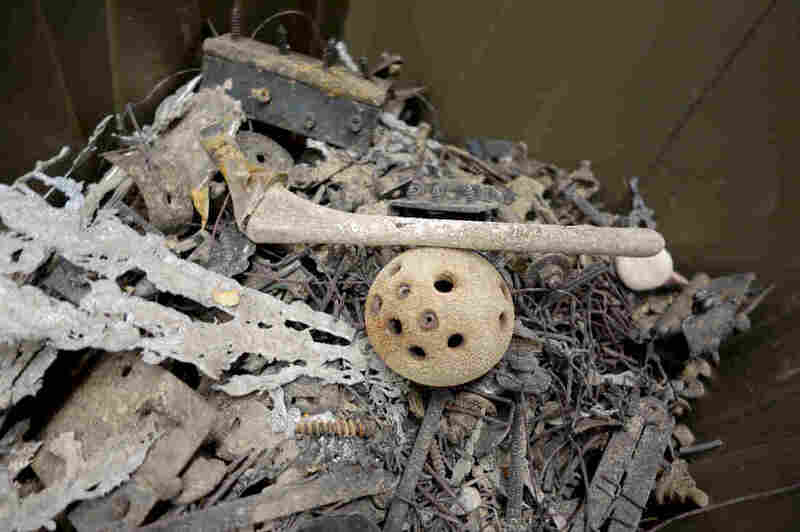 He picked up a hip replacement — a hollow metal ball — then dropped it back into the ashes. I'm a health reporter, so I know a fair amount about the things that could kill me, or are already killing me. But watching this piece of metal that used to be inside a human be tossed back onto the heap gave me pause. I'm thinking about what I might write on a "Before I Die" wall. I still don't know — there are many things to do before I go. But I'm thinking about it a lot harder now. This story is part of NPR's reporting partnership with Side Effects Public Media and Kaiser Health News.